Nancy Pelosi's looking pretty good for a woman who celebrated her 70th birthday last month. A little too good, according to the Washington Examiner. 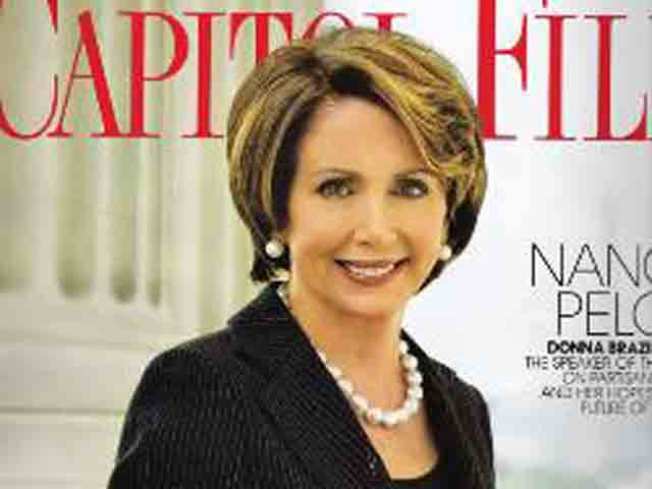 Pelosi appeared on the cover of Capitol File this month, looking awfully youthful. What's her secret? Either she's a vampire, or she's received the airbrush treatment that's standard practice for any high-profile public figure. We're guessing it's the latter. Pelosi's defenders point out that The Examiner is owned by conservative billionaire Phil Anschutz, no friend of the California congresswoman. And many of the websites criticizing Pelosi's airbrushing are curiously silent on the topic of the curiously smooth skin on the cover of 64-year-old Laura Bush's new book. Pelosi's not the first to raise eyebrows over the appearance of airbrushing. Newsweek went to the trouble of assembling a rogue's gallery of photoshopped celebs, including such youthful figures as Kate Winslet, Andy Roddick, and Jessica Alba. Although men and women alike routinely go under the knife of Photoshop, it's usually only women who get criticism. Apparently, the saying "nobody's perfect" really is true.